An estimated 190,000 to 2 million Chinese are incarcerated for various reasons. The prisoners include religious and political dissidents, unregistered Christians and counter-revolutionaries. They are victims of trumped-up charges brought against them by local police, who then place them in horrible “re-education camps” with sentences of up to four years without a trial. Sentences of re-education through forced labor are issued as a form of punishment circumventing the Communist judicial system. During incarceration, detainees are subject to political re-education, slave labor and torture, which sometimes result in death. 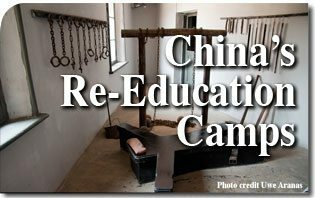 With one of the worst human rights records in history, Communist China now feigns to be concerned with those in these labor camps. The secretary of Central Politics and Law Commission, Meng Jianzhu, recently told a legal conference in Beijing that the Communist party had finally decided to stop the use of “reform through labor” and intends to pass new regulations during the annual meeting of the Chinese parliament in March of this year. After so many years of denial, China announces this change as if it is doing the world a favor. After years of ignoring the camps, the West looks upon the announcement as a positive sign of change. But as with all things in the communist regime, appearances can be deceiving. The change will not release those currently incarcerated. Rather, they claim no more prisoners will be added to the present system. Even this small concession must be taken with a grain of salt; the Communist philosophy holds that the end justifies the means. In such an amoral climate, when they are silent, they conspire, when they speak, they lie. Beijing based human rights lawyer Li Fangping is certain that they will just give the re-education camps a new name — and everything else will be business as usual. The new Chinese euphemism might be called “an offense correction committee.” This is much like calling abortion, health care! Why? Because the term labor camp resonates too poorly to be accepted by the international community and has drawn too much criticism for comfort. Meanwhile American businessmen were enamored with doing business with China, profiting from horrible labor practices, transferring jobs and technology to a hostile regime in the hope that they would embrace democracy and the free market. Instead, China continues to persecute the Church, abuse and impoverish her people, bully neighboring countries, build her military and engage in sword rattling. The existence of reform by labor camps comes as no surprise to anyone who understands Communism. Unfortunately, the naïve maintain the impression that labor camps had been extinguished with the Gulag. Some questions remain: Why is the West not holding China accountable for these camps that China now acknowledges as existing? Where is the indignation over the lack of human rights for these poor victims who have no voice? This entry was posted in News Commentary and tagged abuse, American, Beijing, business, camp, China, Chinese, Christian, Church, comment, communist, Council, dissident, force, Gulag, human, labor, legal, moral, naive, persecute, philosophy, political, prisoner, re-education, religious, rights, TFP, UN by Gary Isbell. Bookmark the permalink.